That’s all it cost for one of the best lunches I have had out in a long time. OK, I’ll admit I was down about the whole Sydney flight thing (read “Instant Karma“) and anything compared to that would have seemed great, but the wife’s suggestion to eat at Rangiora’s Blue Rooster turned out to be an inspiring one. I have been there once before and enjoyed a good cup of coffee, but this is the first time I have eaten. And whenever someone suggests “it’s good” I feel I have to sample the wares as food is subjective and cannot possibly suit everyone. …this tweet probably sounds more threatening than it was intended, but on the other side of the coin, the last two visits to said fast food chain were hardly worth writing home about. Less than an hour ago I moved on down to my local KFC outlet, book in hand (the same one as last week, now about 100 pages from the end, not good meal reading I might add! ), and waited to make my order. the lovely young thing behind the counter pointed out she wasn’t going to serve me but was happy enough to chat about the pending doom of the Tower burgers – finishing this Monday it seems (along with the Packs) no doubt to be resurrected sometime next year. Then finally ordering, and in fairness to KFC I felt I had to trial the other two offerings; Original Tower, and a BBQ Bacon Tower which I had upsized as a combo with fries and Mountain Dew (orange). The BBQ was made into a Zinger, as there is no spice like hot spice. Not spicy at all...was the burger? 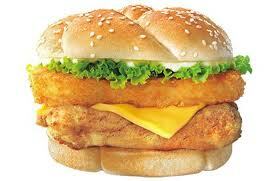 @MaccasNZ We’re tucking into the brand new Chicken Scorcher burger and living it. Spicy. @MaccasNZ (to @the_alfmeister) Haha! Well each to his own, but we think it is pretty spicy! After this initial banter on Twitter (ahhh, I hear some of you say not understanding all the hieroglyphics of above) 9 days ago it had been in the dark recesses of my mind to trial this supposedly ‘spicy’ offering, like a virgin sacrifice to King Kong. Well, loyal reader of all things useless, today was that day where I took that challenge. Armed to the teeth with my latest book (review to come later, 700+ pages) I wandered into Maccas on Moorhouse Ave in CHCH on a stunning Canterbury day. The birds were singing, and their was joy in the world as behind me the Grand Chancellor was being dismantled piece by painstaking piece…don’t know why they don’t fucken blow it up like the Yanks do, you can at least give them credit for that! Disappointing, to say the least. Now I’m not sure if it was down to the store, or the choice in burger but this did not do it for me. In keeping with comparing like with like it seemed the appropriate burger to taste however barely halfway through it I found myself wondering what might have been in choosing the BBQ Bacon or their stock-standard Tower. Not sure which one everyone has raved about to me over the last week, but I doubt it is this new offering from KFC.